Lesley Miller has battled body issues for the best part of her 21 years on this planet but she's given two fingers up to the unrealistic ideals society pressurises women into fitting and we could all learn a thing or two from her about feeling comfortable in our own skin. We're hailing Lesley Miller our new poster girl for body confidence after she shared an unedited photo of herself in her very first bikini on social media recently. 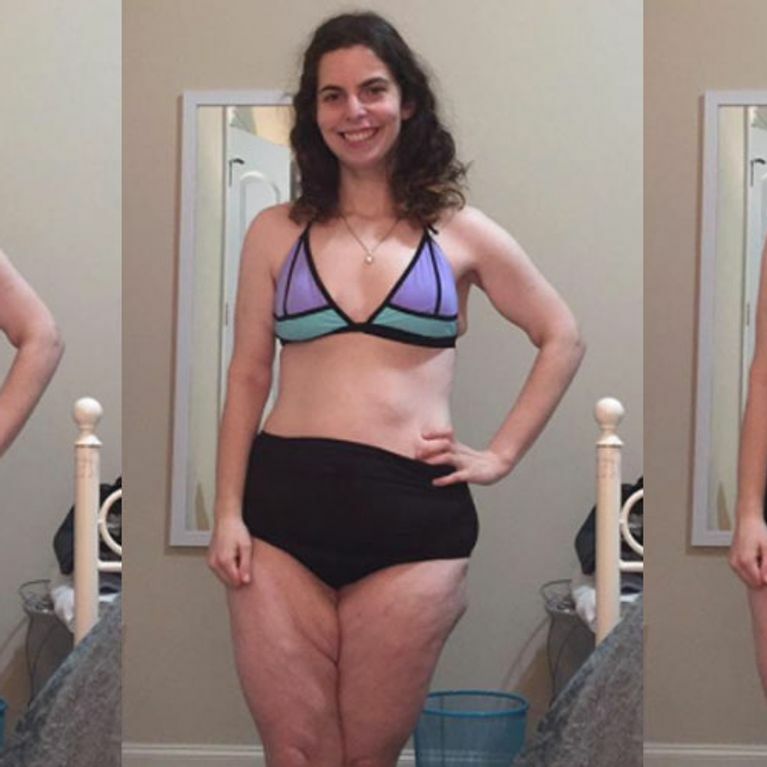 The brave 21 year old showed off her unique bikini body on Facebook in an attempt to encourage women to 'love what matters' and the resultant post has become a viral hit for all the right reasons. In the accompanying post, Lesley tells the story behind the picture and it soon becomes clear that stripping off on social media is a milestone moment in her life after battling weight issues since the age of three - she attended Weight Watchers meetings aged seven and became the youngest person to have weight-loss surgery before she was even a teenager. In the open group, she explained: "I've spent the past 18 years of my life waiting. I kept my body covered up and hidden away. I told myself that one day I would finally let myself be seen; I would finally do all of the things I dreamed of when I was enough. Thin enough, happy enough, confident enough. When my body looked the way that it was 'supposed' to. "When I was three my classmates asked why I was so much bigger than them. Why I didn't wear the same smock they did. When I was seven, I lied to the lady at Weight Watchers, desperate to sit in on meetings full of middle aged women trying to shed a few pounds. When I was nine I went to weight-loss camp and stood in line the first week to take my 'before' photo. When I was 11 the surgeon cut into my stomach and he told me how happy I would finally be." ​Lesley went on to tell the plus-three-million members of the group that at her most desperate she even 'cut into my own skin' because she thought she 'deserved it'. While her story is heart-breaking, she's come out the other end with her head held high and more determined than ever for the female population to love the skin they're in, warts and all. "So now I'm 21 and I bought my first bikini. EVER. You can see it all. Weird bulges and rolls of fat. Hanging excess skin. Stretch marks, cellulite, surgical and self-harm scars. Awkward protrusion on my abdomen from my lap band. I want to learn to love all of myself, not just the parts I've been told are 'acceptable'. Because the secret is, I was always enough. And you are too ."